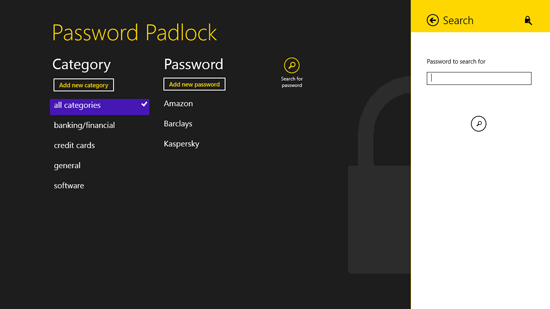 Password Padlock is a powerful free password managing app that is available for Windows 8 and 8.1 desktop. 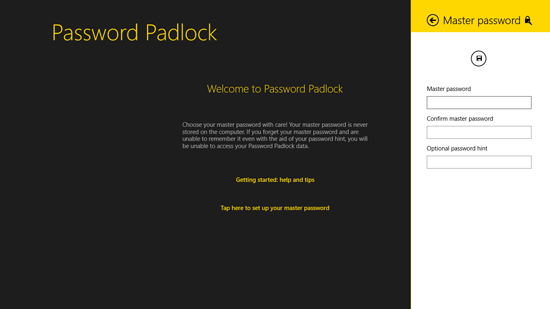 When the Password Padlock app starts it asks you to create a master password to protect the other added passwords, so you can create a master password and give a hint for it too. The app is helpful in recording all kinds of passwords you have such as banking or financial, credit cards, general and software. The password managing app saves your passwords for each of the category mentioned in it. The input fields of all the categories differ from each other, these fields vary in the manner of account number, serial number, credit card number, password. The other best feature of this password managing app is that it logs off from the account every time you close the app or switch to other apps. So the times when you have to come back to the Password Padlock, you will have to enter the master password to access the passwords again. The color scheme of the app is set to dark grey and yellow, the text in the app is clearly written. The categories are well defined depending on their usage and importance. The user can add new category by clicking on Add new category button under the category list. User can also add new passwords with the help of the Add new password button below the Password tab. You can access menu by right clicking anywhere in the app. All the passwords saved in Password Padlock can be exported to OneDrive using the Upload to OneDrive button or options/settings button. It can be exported as a text file to it. You can logout manually from the Password Padlock account. Passwords from OneDrive can also be downloaded using the Download from OneDrive option from the menu.